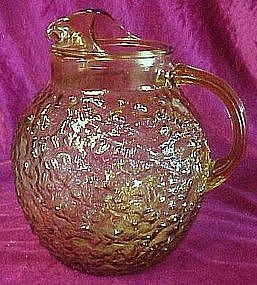 Anchor Hocking Milano or Lido amber ball shape pitcher. Excellent condition. It is 9" x 8 1/4".Called Milano in 1960 or Lido in 1970. Pitcher is bulbous shaped. The outside of the pitcher has a "crinkled" or wrinkled texture. Excellent condition with no damages. I have more glassware to match this.